Happy Monday, friends, and May the 4th be with you! Today I’m just bursting with bright, springtime bloominess (not a word but should be) because there’s an Edible Flower Potluck petaling up (also not a thing) the interwebs! This gorgeous, flower-filled potluck started with Renee (as lots of good things do), and I have to say, I’m not sure a more beautiful (if virtual) potluck ever existed. Just look at all of these gems! I don’t have a lot of experience cooking with flowers, so I made sure to do my research – not all flowers are edible, and I’m not trying to poison anyone, y’know? Luckily, there’s a pretty extensive “these-ones-won’t-kill-you” list here so, with that in hand, I went foraging in the back yard. The past few weeks have been particularly fun to own a yard (#adult). Here in Seattle, so much is blooming! As things poke up from the ground and reveal themselves, I’ve learned that I am the proud owner of two crimson rose bushes, a cluster of white calla lillies, many stalks of giant purple irises, a bunch of about-to-bloom peonies, spotty clusters of dandelions (that Ben keeps ripping up “because they’re weeds”), dainty bows of bleeding hearts, a purplicious rhododendron, scattered yellow poppies and one gorgeous lilac tree. Plus a bunch of outliers that I can’t identify. But, such bounty! In the edible department, I had my choice of dandelion, lilac or rose. But the roses haven’t bloomed yet and the dandelions keep disappearing from the lawn (thanks, Ben), so I set to work on the lilacs. Turns out they have a strong floral (duh), and slightly lemony flavor. 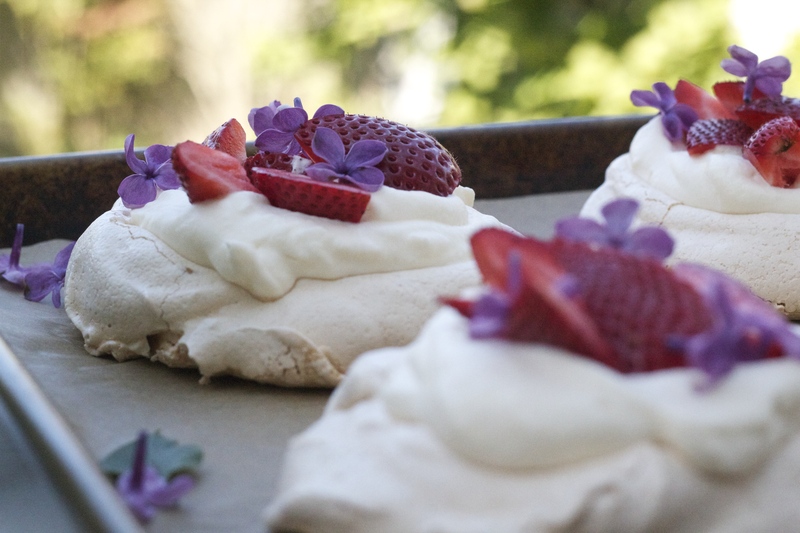 I decided to use them sparingly and paired them with strawberries and plenty of sugar in these show-stopping, individual pavlovas, and they were aaaaalmost too pretty to eat. Almost. It’s May! And almost Mother’s Day! Eat your flowers! Pavlovas sound intimidating, but they’re just meringues (whipped egg whites and sugar) topped with whipped cream and fresh berries. Simple! And such stunners. A few tips for success: use room temperature egg whites, and keep an eye on them while they whip — overwhipped egg whites look foamy/soapy and brittle, instead of glossy and smooth, and don’t spread or bake up very well. Also, if you don’t have time to let the meringues sit in the turned-off oven for 4 hours or overnight, I’m going to go ahead and say that’s fine. They’ll be a little less crisp (and a bit chewier), but they’ll still taste great. Heat the oven to 200°F, with a rack in the center position. Line a sheet pan with parchment paper. In the bowl of an electric mixer fitted with the whisk attachment, beat the egg whites, salt and cream of tartar (or vinegar or lemon juice) until very frothy. Slowly add the 3/4 cup sugar, continuing to whip, until the egg whites are very white, glossy, and form medium-stiff peaks. Use a spoon to scoop the meringue into six, roughly equal-sized mounds on the prepared baking sheet. Press the spoon gently into the center of each mound to form a small well in the center of each. Bake the meringues for 2 hours, until dry and crisp (and, Ina says, not browned, but I let mine get golden SO WHAT). 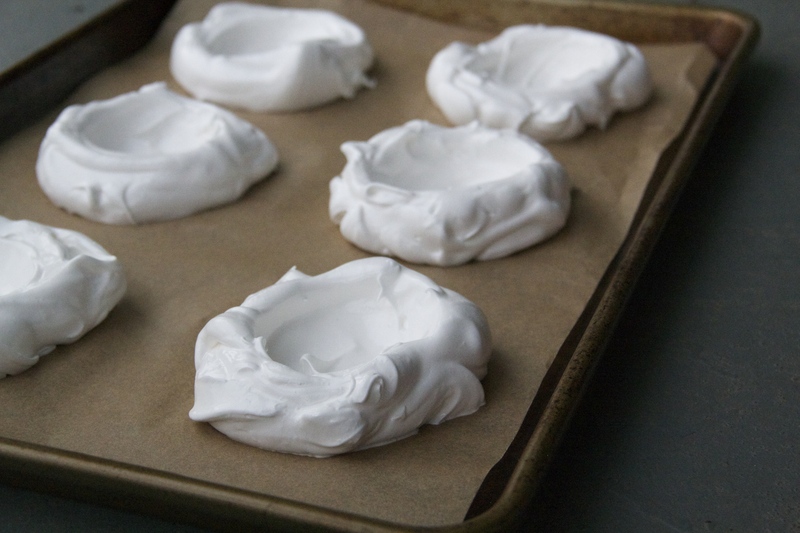 Turn off the heat and let the meringues sit in the oven for 4 hours or overnight. (If you choose to make these in a day advance, store them in an airtight container at room temperature). When you’re ready to assemble, whip the cold heavy cream with a tablespoon or two of sugar and a splash of vanilla, until medium peaks form. Spoon the whipped cream generously into the meringue shells. Top with fresh berries and a scant scattering of lilac petals. 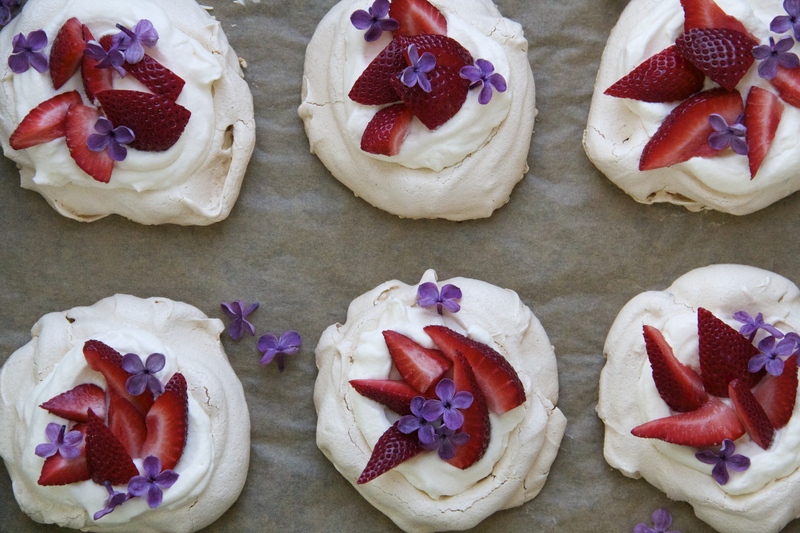 I love pavlovas and the combination of strawberry + lilac in these sounds just wonderful! ahh yay! Thank you, Kathryn! Pavlovas! Such a smart and delicious backdrop for edible flowers. Please post pics of this Seattle garden! thanks friend! I will work on posting some pics! yessssss! these are amazing! i’ve always wanted to try pavlovas. and topped with lilacs! obvs i love lilacs, and these turned out wonderfully! thanks so much for being a part of the potluck! These look amazing! You are so right about this being a great Mother’s Day recipe! These are beautiful! + So cool that you got to pick the flowers from your own backyard! I haven’t had a pavlova in so long. I think they’re a perfect vehicle to highlight the flavor of the lilac, and so pretty, too! It kind of totally does feel like Christmas! These are the prettiest!! 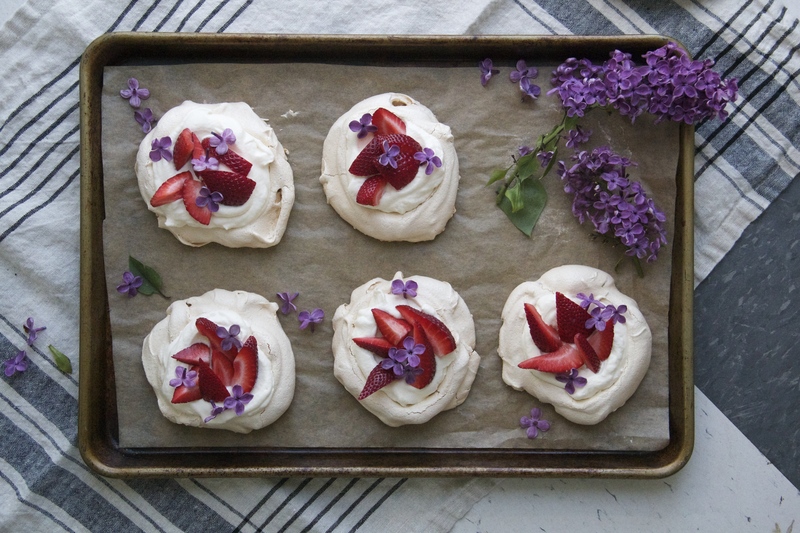 I’m such a fan of pavlovas but have never thought to top them with heavenly lilacs! Love!! I am just loving the edible flower pot luck theme! 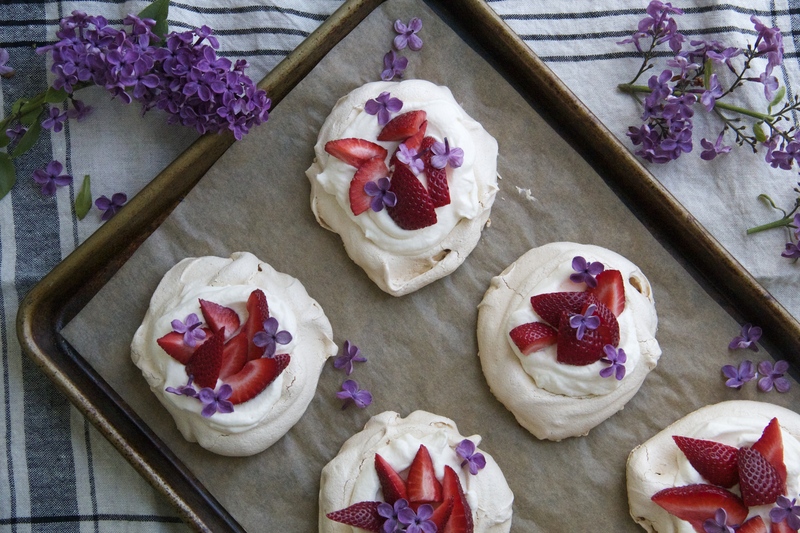 These strawberry and lilac pavlovas are so dainty and beautiful.. perfect for Spring and the up-coming Mothers Day. I agree! Love seeing all of the beautiful, flowery treats out there. 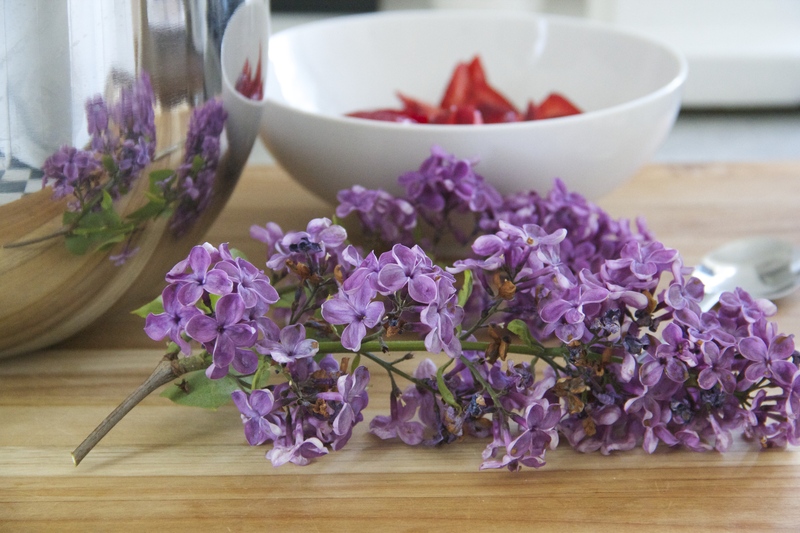 I can’t believe you foraged these purple pretties from your backyard! I’m impressed (and also super jealous – I’ll trade you some weeds for lilacs??;). This is the bloomiest (totally a word:) pavolvas ever! Haha using the word “foraged” makes me feel so LEGIT, but really all I did was trot out (5 feet, mind you) to the backyard and pluck these little petals from the nearest tree! But I will take it 🙂 Thanks friend! oooh yes, make them! That’s part of their beauty — they look intimidating but in reality are a cinch to pull off! This is so beautiful!! I’m seriously having the best time browsing through all the contributions of this flower potluck. I’m so happy Renee set this up – I feel like I’m discovering so many awesome blogs. So happy to find yours!! These pavlovas – I want to both sleep on them because they look so fluffy and soft and eat them, because they look so darn delicious!